Bad weather this Saturday past brought a load of guys in looking for foul weather protection. Trooping thru the doors also were a couple of young Russian lads about to start a RYA course with Melvyn Wallhead of Northumbria Sailing at Royal Quays marina. Our Russian friends must have heard about the notorious North East climate because they made a beeline for the breathable boots area, after trying on the various makes we stock, one chose Henri Lloyd Extreme & the other Dubarry Newport. Selling well yesterday were the new Musto HPX breathable boots which feature the Outdry Breathable Membrane. Doors officially close at five on a Saturday however it was at twenty to six that the last happy shopper left. 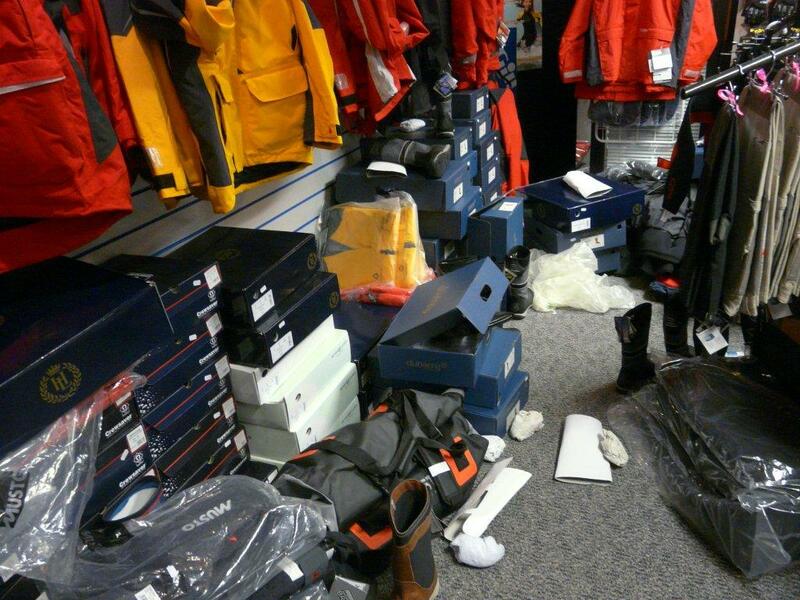 Sunday morning will be spent tidying the clothing area which as the image shows looks like it's been burgled! Incidentally if your budget won’t stretch to breathable boots consider a pair of Sealskinz waterproof breathable socks inside your conventional yachting boots. This entry was posted in General Interest and tagged Dubarry, Henri Lloyd, Musto, Sealskinz on April 29, 2012 by Iain Forrest. In one of my earlier blogs (Monday the 16th to be precise) I posted a couple of pics showing a rather nice Van de Stadt at a rather funny angle! Mooring rope had chafed through and the end result was interesting to say the least. I did mention an excellent chafe protector called Spiroll and now here is another. One of the foremost rope manufacturers in Europe, English Braids, have started to import Chafe-Pro into the UK and its starting to sell well! The demo of Chafe-Pro is quite impressive with footage of it being attacked by a belt sander. This entry was posted in New Products and tagged Chafe, Mooring on April 27, 2012 by Iain Forrest. Yes, we've added Paypal as a payment option. For those of you with a PayPal account, it's much faster and there's no card details to enter. This entry was posted in General Interest and tagged PayPal on April 27, 2012 by Iain Forrest. This entry was posted in Electronics and tagged Bluechart, garmin on April 27, 2012 by Iain Forrest. Having just spent two days down at Hartlepool marina in strong North East winds & driving rain, it's then one gets to appreciate some of the good things in life, namely my Musto Goretex mid layer salopettes & jacket. Even though they are looking a bit tired (probably ten years old) & are now covered in abrasion marks they still are a lifesaver when doing a mast climb in the cold & rain. Every couple of months they get Jenny's famous treatment i.e. washing in Granger's 2 in 1 cleaner & waterproofer. This treatment washes the garment & then when you tumble dry, gives the fabric back its water repellancy. It's great for foulies once the rain or spray does not bead on the surface. Tomorrow its Amble fortunately no mast climbing, working on a cockpit cover but judging by the forecast the Musto kit will be in use again! This entry was posted in General Interest, Tips and Advice and tagged Grangers, Musto on April 27, 2012 by Iain Forrest. A HALYARD RAP IS NOTHING TO DANCE ABOUT! I had a guy in the chandlery last week complaining that his roller reefing genoa was so hard to furl that he ended up with blisters on his hands! First thing I always say is 'Did you look up to the top of the headsail & did you find a halyard wrap'? 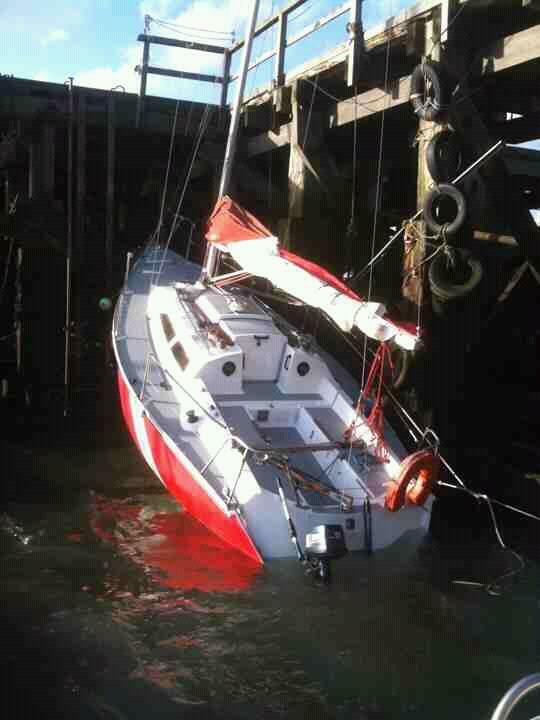 Nine times out of ten a furling problem is caused by halyard wrap & if you end up winching the sail in or out it can so easily cause the mast to come tumbling down! Today I was fitting a cover in the marina where his yacht is berthed & after finishing my other jobs I grabbed my camera, went over to his yacht, first thing I noticed was that the sail was short on the luff & the head swivel was not at the top of the foil,which means that there is a very very high chance of getting a wrap even though there was a diverter fitted. I then set the camera on max zoom & once back at work put the pics on the computer & evidence of halyard wraps could be seen, shiny metal where the anodising has been scraped off etc etc. 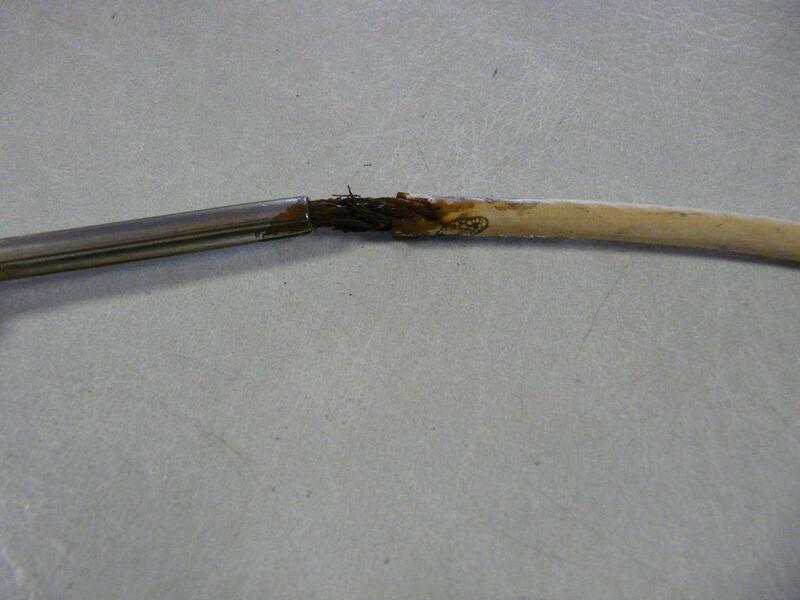 To cure, suggest either a strop at the tack of the sail to effectively increase luff length, however this may cause sheeting issues, if this is the case your local sail maker can put a longer luff tape on the sail which would mean the swivel will go all the way up the foil however the clew remains in the same place & sheeting is not an issue. Another thing I learnt from the image was that the bronze snap shackle was probably causing some of the problem, it should be cut off & the halyard then shackled to the head swivel using the special shackle provided by the manufactures of the system. If however you get a riding turn on the drum its probably caused by the furling line not being under tension when you pull the sail out, a Harken furling line ratchet block is perfect for providing the correct amount of friction. 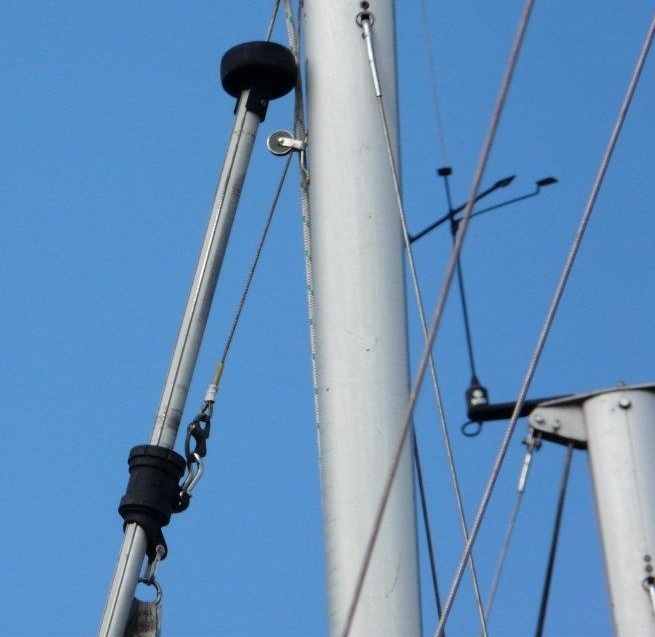 If you do get a wrap it is essential that you get a rigger to check the forestay out to see that it has not spread the wire or as we say caused it to bird cage. 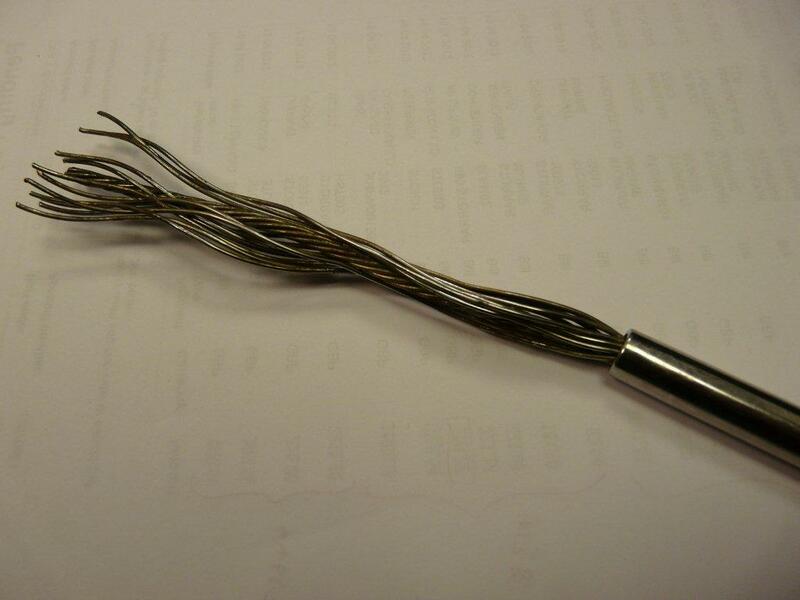 This entry was posted in Tips and Advice and tagged furler, furling on April 17, 2012 by Iain Forrest. If you are on the water between now and 26th April in the Minch or anywhere between Loch Ewe and Cape Wrath be advised: This month's Joint Warrior exercise could see jamming for an hour at a time. In a notice to fishermen, Joint Tactical Exercise Planning Staff (JTEPS) said there was the possibility GPS services could be denied to civilian users for periods between 17-26 April. The jamming would be done around Loch Ewe and Faraid Head in Sutherland and at times that would include from 09.00-10.00 and 19.30-20.30. JTEPS said in its notice that the activity could affect vessels in the Minch and was subject to approval from the Ministry of Defence (MoD). However, it added that prior warnings would be given. Satellite TV, mobile phones and internet connectivity may also be disrupted. This entry was posted in Electronics, General Interest and tagged gps on April 17, 2012 by Iain Forrest. Northerlies blow . . .
Up North we sure do love those Northerly winds, they stop us worrying about global warming & they give me something to look forward after a day a hard day at work, a bracing walk with my dog along Tynemouth Beach! Today Saturday the 14th yes we have.......Northerlies & there is a nip in the air. It’s always worth checking your lines on a regular basis, especially if there is a blow forecast, if you can get down to your boat or get someone else to check it all the better. Chafe being the enemy to protect against otherwise you could end like poor ‘old’ Crackerjack, who’s stern line broke the other day when the North wind was blowing, the bow went forward into the wooden piles & the tide dropped, fortunately there not a lot of damage was sustained. Here at the chandlery we stock a wide range of diameters in mooring ropes or dock lines as our American cousins would have it, from ‘well known manufacturers’ (I stress well known ‘cos there is a lot of poor quality ‘looks like a bargain’ imported rope coming into the country. If you want us to splice soft or hard eyes in your warp that’s not a problem, just give us a little notice. . . . New in stock we have Spiroll chafe protectors. This clever innovation wraps around the line and is held in place by a little electrical tape at each end. No need to feed all the way from one end, same as the outstanding Kingflex mooring compensators. These Swedes have been hard at work thinking out these time saving ideas for mooring. Fenders likewise; put lightweight fenders on your 12 tonner & you are asking for trouble. Fenders of course can be ‘popped’ during gales so a regular inspection of them is a good precaution. 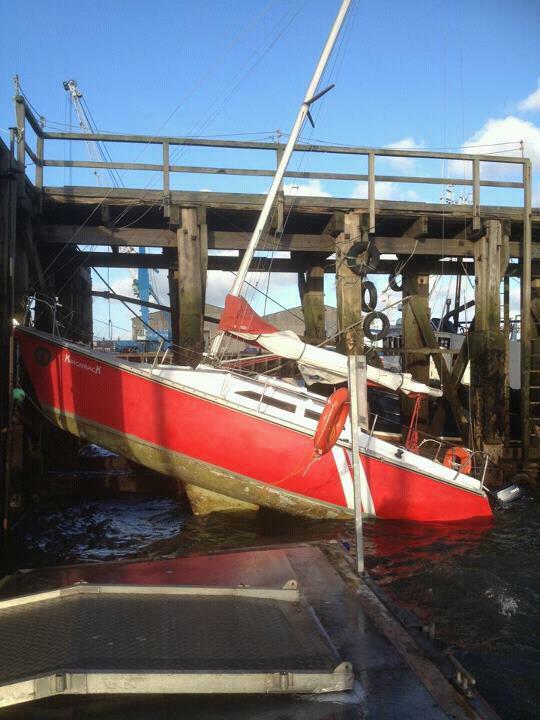 This entry was posted in New Products, Tips and Advice and tagged Chafe, Mooring on April 16, 2012 by Iain Forrest. This entry was posted in General Interest, Safety and tagged guardrails on April 10, 2012 by Iain Forrest. I thought I had seen it all (with almost forty years working in the marine trade) however this Easter Saturday we had a guy in the shop who brought in a split diaphragm assembly from his Whale manual bilge pump. He had just purchased the boat & when he tried the pump for the first time it 'seemed to work' Good Friday he popped down to the marina to tinker with his new purchase & his mate tried the pump, no resistance so he took it apart! On closer inspection one can see that the diaphragm has been split however instead of purchasing a repair kit the previous owner had just patched it with a piece of vinyl! Look closely & can see where the glue has holding the vinyl to the neoprene has failed. I suggested that perhaps, he should have a thorough check of all the equipment on the boat before taking to the high seas & gave him a copy of that excellent free RNLI booklet which comes complete with a CD-ROM! 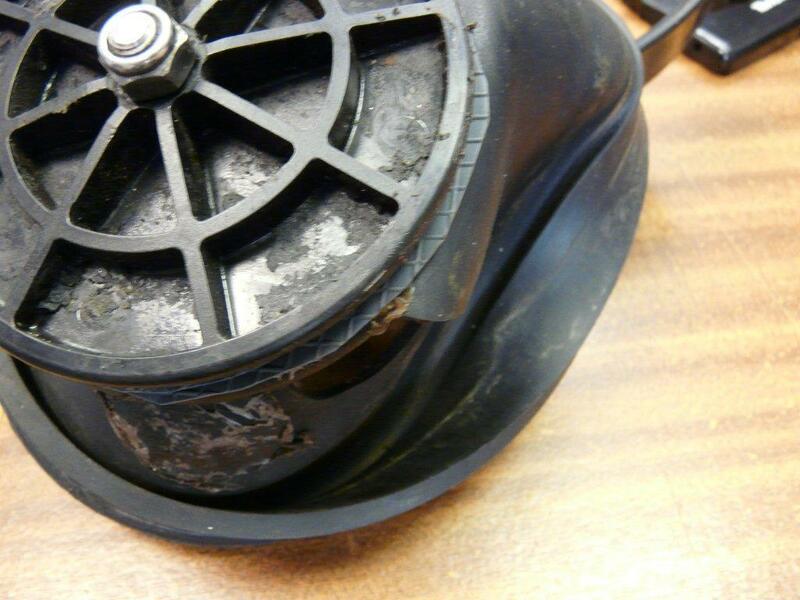 This entry was posted in Safety and tagged Bilge Pumps, RNLI on April 8, 2012 by Iain Forrest.